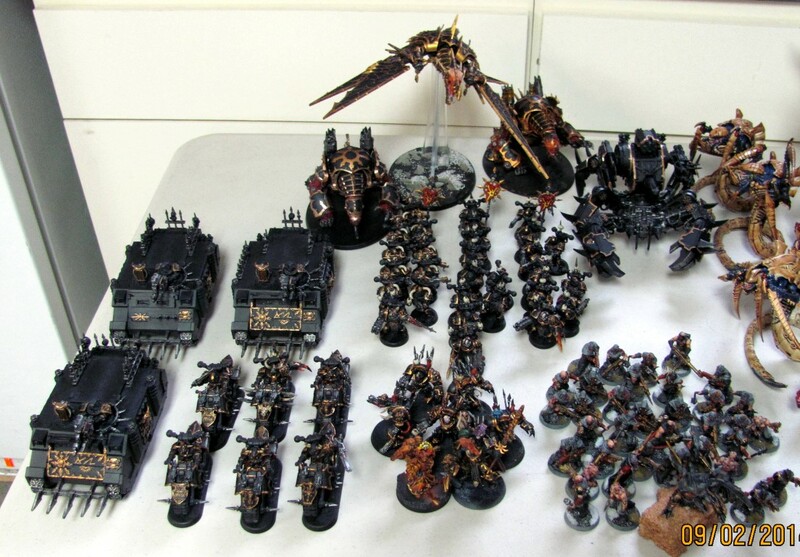 In continuing our Apocalypse wrap-up, we move on to army lists…. Much like our normal Apoc games, we didn’t split up teams in advance. 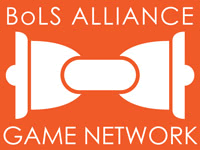 We do this because, although some people like to build lists together, we find that gives them a strategic advantage over many of our more casual gamers. Competitive players already have an advantage, so anything to even the playing fields seems like a good idea. We came up with an arbitrary point limit of 180 power, but allowed people to share extra power if they wanted (because at least one player toyed with bringing a warlord titan at 200 power). People were pretty loosey-goosey with the power levels though, but it all worked out in the end. I don’t recall what we called the teams, or even how we picked them. My guess is that we divided things up as evenly as possible ahead of time with pre-chosen teams (but folks didn’t know). This would split apart those folks that habitually play with each other, and then take those people that don’t often win, and spread them around to ensure that at least half of them would count as winning. In our recent Apoc game, we went old school in how we picked teams. I mean, truly old-school. Like, line up against the wall and let’s revert to a popularity contest of drafting teams. Generally I’ve avoided this because nobody wants to be picked last, but we figured that allowing the generals to pick their teams would thereby allow for more balance (or at least more strategy) when it came to dolling out the missions. By the way, this is also the point where I’d normally include photos of all of the forces, but they may be a little lacking. Everyone put their armies out to display, but I didn’t get photos of many of them (no excuses). Luckily, Simon managed to snap a few shots before the game, so I’ll include them below. 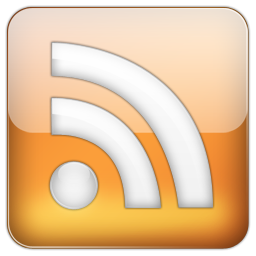 (Thanks Simon). Kurt is one of the guys in our gaming group that has enough models that he can play a largely unique army each time he plays in an Apoc game. 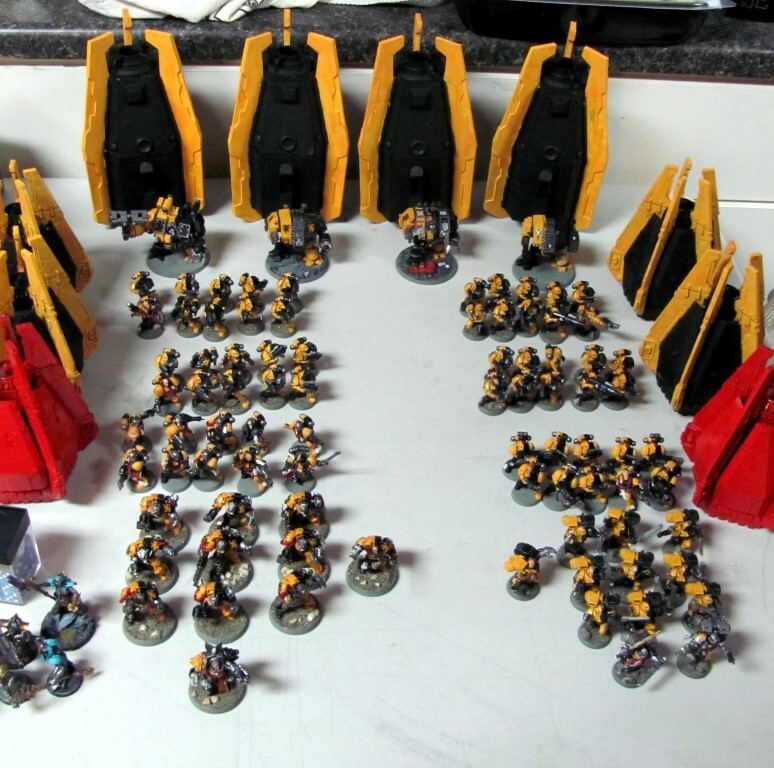 He can do this while generally playing the same codex (though he has been known to dabble by throwing in some Eldar or IG to supplement his Space Wolves). In previous games, he has brought lists that consist almost entirely of Titans, or foot troops. This game he was very heavy on dreadnoughts in drop pods, which was–quite frankly–something I didn’t even know he owned… at least not in that quantity. 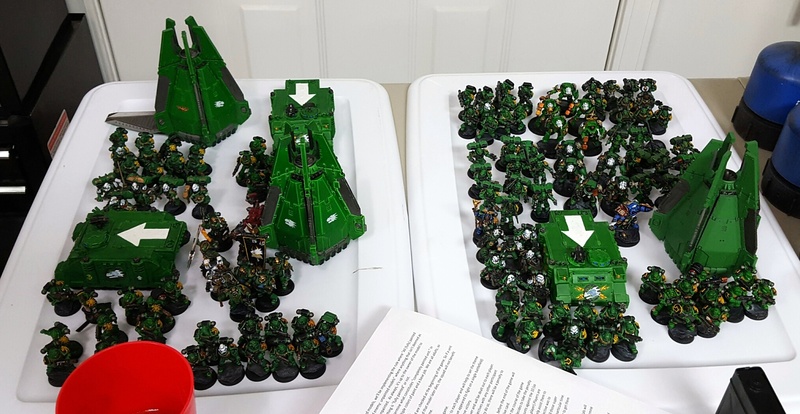 It was interesting to see how they faired, especially because it seemed like most of them were dropped right in my face–but I’ll leave that for the actual battle report. I think Dan wins the award for the most distinct units. It’s apoc and there’s no Force Org Chart though, so it’s a distinct advantage to break up clumps of units into smaller factors. 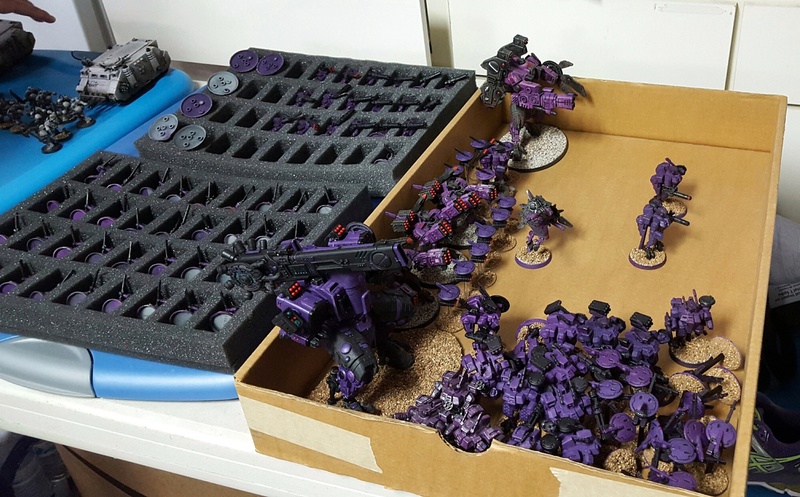 In talking with him before the game, he was originally going to play another list entirely, but due to time constraints, he grabbed a box of models that he had laying around and turned that into a list. 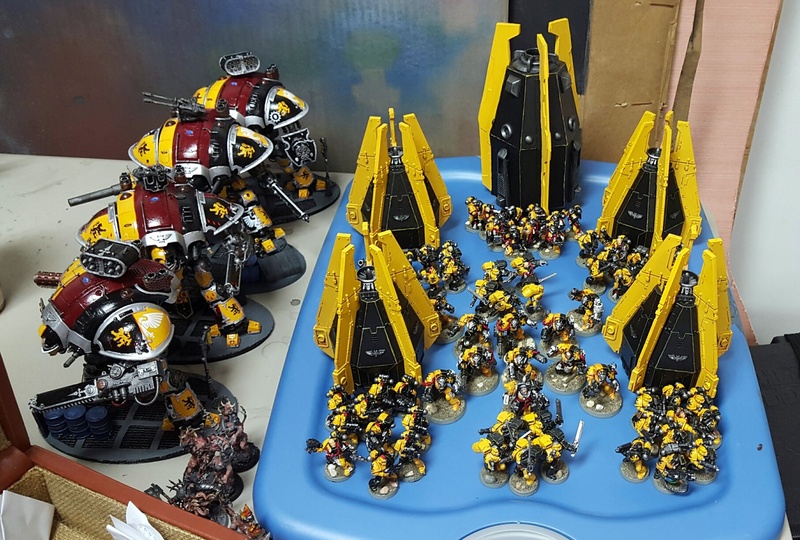 Yes, it might be odd to think that one just has a box of this many painted Tau ‘just laying around,’ but I’ve seen Dan’s garage and I whole-heartedly believe him. Sam virtually always brings a drop-pod list because that’s really his shtick. True to form, they made a bit of a show for our game, but the primary focus was the knight titans that he has been collecting for a while now. 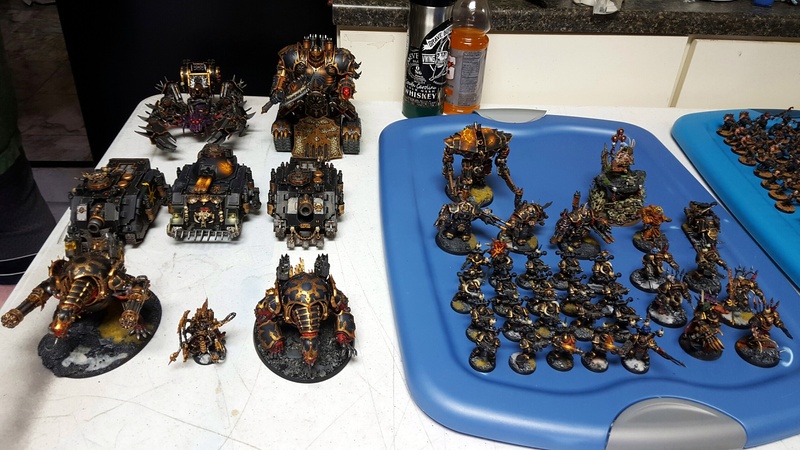 They’ve been collecting dust on a back shelf somewhere, but he kicked things up a notch and got all of the painted specifically for this APoc game. It’s great to use games like this as inspiration to finally paint something that’s been neglected for a while. Drew is a guy we don’t see nearly enough, but on occasion we can draw him out with an Apoc game. It’s good to have him over because I used to see him on a weekly basis, and now we’re relegated to once per year. I was especially happy to see him on the other side of the table because he had all of those rhinos… again, more on that in the actual battle report. My Apoc list doesn’t seem to vary all that much from game to game. The biggest change this time was a lack of fortifications and the addition of some flyers. I had wanted to paint up some Storm Ravens too, but time got the best of me. Between Mitchell and Albert we actually had two copies of Typhus on our side of the table. Albert’s version was slightly less protected as he wasn’t hiding behind nearly 200 various zombie & demon models. If Sean wins the “least models on the table rule,” Mitchell definitely walks away with the most models (177 total for anyone that’s counting–which is more than three times as many as Sean had). The first force was that of the Imperium, consisting of a combination of Salamanders & Imperial forces (IG with some knight allies). 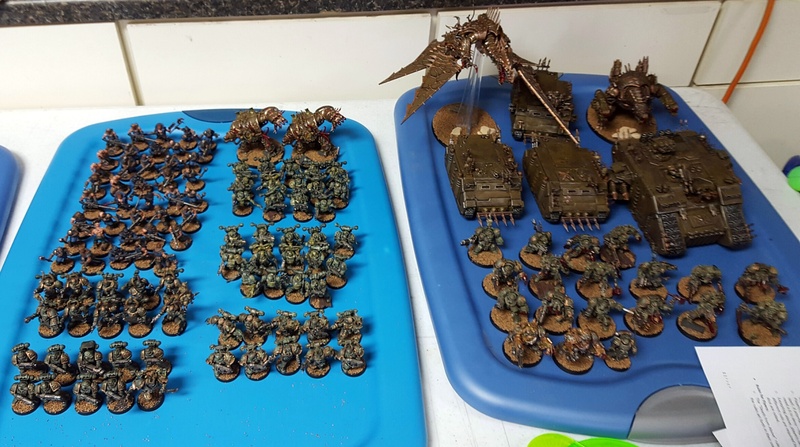 Brandon has been looking for an excuse to paint up the final few squads of his marines, so when we decided to play an Apoc game, he knew he would just need to paint up 30 marines to finish up his battle company. 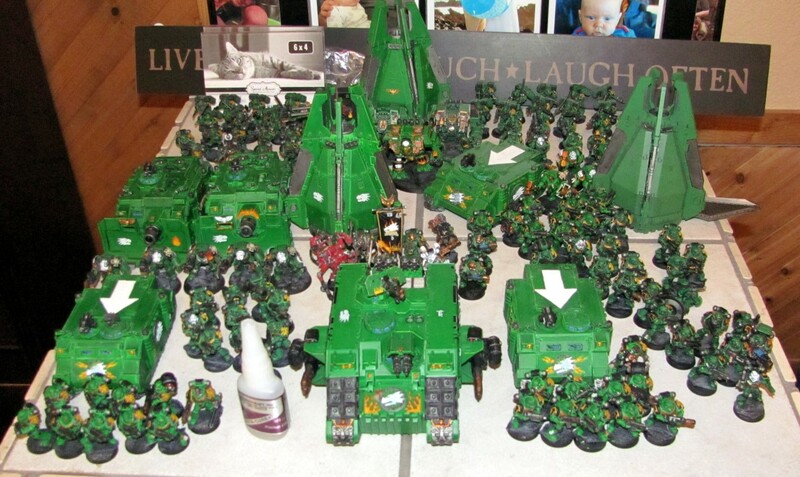 They really looked sharp too, to see an entire company of marines painted up to a nice/consistent standard. 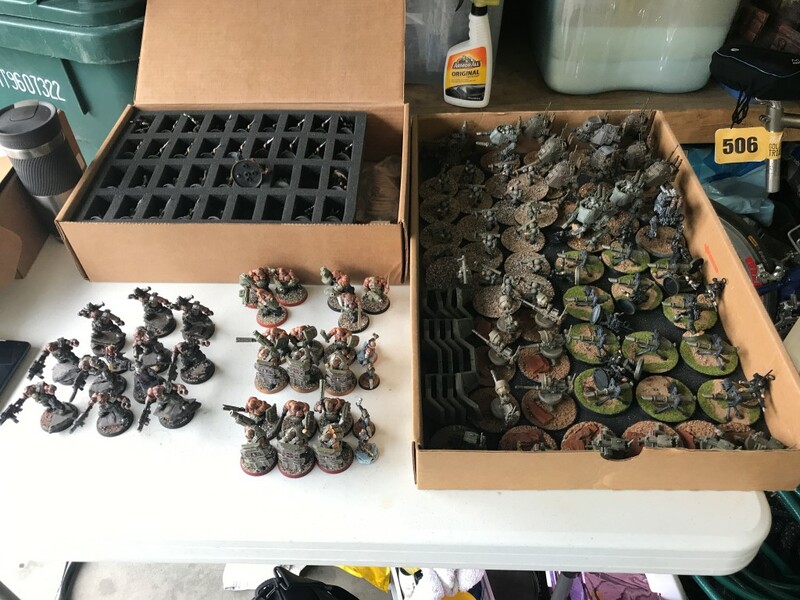 This post is a continuation of the review of our recent Apocalypse game entitled “The Fall of Morrsleb.” In this particular post, I’ll be going over the armies that people brought and the breakdown of the teams. In total, eight players showed up of the 9 that had committed to coming. I had a feeling that one person would not show (though in the end, it was a different person that wound up skipping the event than I had originally expected), so I did have a spare 10th person on standby, but it turned out that it wasn’t necessary to bring them in order to balance the teams. There really wasn’t a clear way to break down the teams to me, so we opted to roll randomly determine teams on the day of the game. I kind of like that method, so that people don’t do significant amount of planning together before the game starts. Granted, it’s nice to encourage people to work together and build up anticipation before the game starts, but not many people do that sort of thing, so it could potentially lead to an unfair advantage to a particular team. Definitely a traditional Sam army. That guy loves his drop pods. 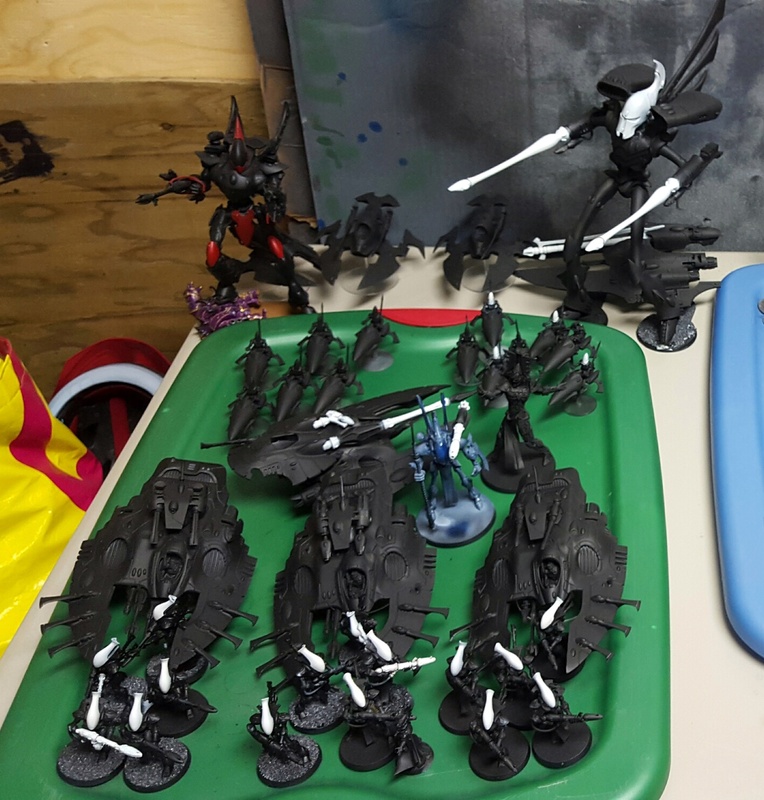 He did spend a week or so prior to the game working hard to get his army painted. Though he almost always plays a bunch of pods, it’s unusual to have him play a force consisting entirely of pods, and he doesn’t normally chose deathwinds, but I built them up enough before the game that he tried them out. Well, at least that’s what I like to think. More likely, he just needed to eat up points at the end, and that was an easy way to do just that. Blaine was in from out of town, so he wound up using my models. 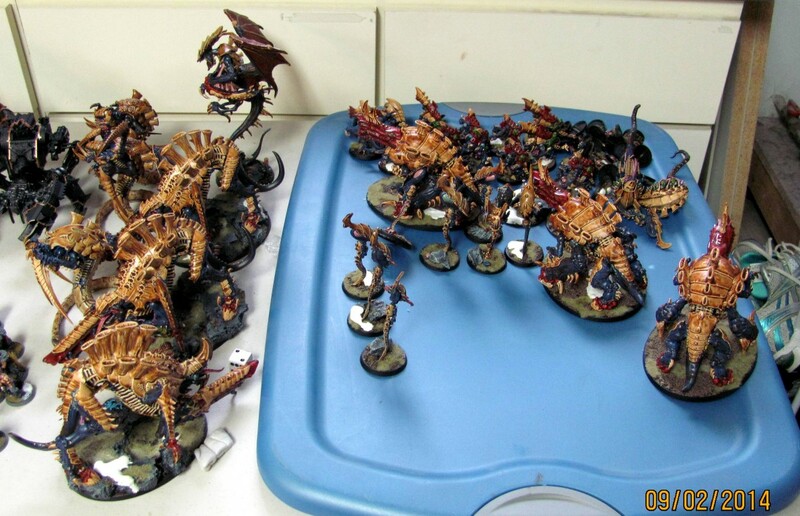 As I said before, I was toying with the idea of playing ‘Nids with him, but as he was building his army, it was abundantly clear that wasn’t going to happen. 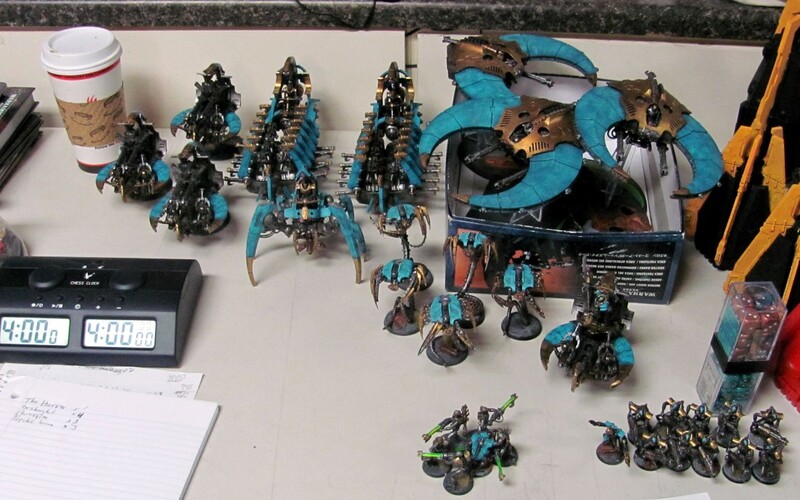 He started off by essentially taking every model that has Synapse that I own, and then followed it up by taking virtually every monstrous creature I owned. Had I decided to play bugs after that, I would’ve been stuck with 3x Tervigons and a Swarmlord as my only synapse, and the only other MC’s I own are two flyers. While that might be fun enough, it would leave me with 3,000 points of little bugs, and frankly, I can’t fathom those movement phases. Danny’s Transcendant C’Tan scarred (and scared) me to no end. If you haven’t seen the stats on that thing, do yourself a favor and don’t. Simon was another of those guys that spent the month working up to the game in a painting fervor. In fact, I’m not sure that any of the models in this APoc game are from his regular army (no wait, the rhinos and cultists probably are). Otherwise though, I think he painted up just about everything specific for this game, and they looked pretty snazzy. Somehow I got thrust into the role of Warmaster for the forces of good (and seriously, with Marneus at the lead of my army, how could I not?). 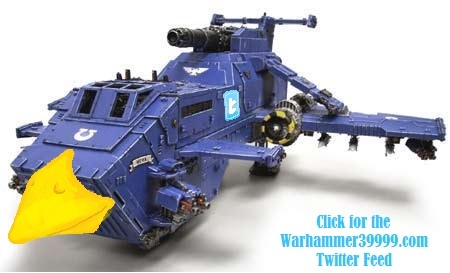 This has become a pretty-defacto standard for me in Ultramarines related Apoc games. When we were in the planning stages of the game, I had hoped to paint up all of my fortifications in order to cover our side of the board in BLOO; unfortunately, I spent the two months prior painting up the terrain for the game (more on that later). So, I fell back on the old standbys: Long Range Firepower provided by the Imperial Guard (No, I won’t call them the Militarium Tempestus, or whatever their new name is). I was able to squeeze in five fortifications (more than everyone else combined), and between all of the little blue guys, the board did have an unmistakable cyan tint to it. Ok, so it’s obvious that I don’t know the Grey Knight Codex. Are all of those different units really elites? Anywho, Cole came out of retirement to play with his brand new codex, along with some throwbacks to the old ‘dex in the form of Inquisitors and Assassins. Most of his army seemed to deep strike down, and he definitely provided the psychic assault of our team. In hindsight, Sean seemed to be the only person who brought models that weren’t painted. I gave him a pass because he changed jobs and moved his apartment during the build-up to the game, and he did have most of his force painted (in fact, I think he had all of the space wolves painted). Besides, he’s only been playing 40k for a year or two, so frankly, his progress is amazing. 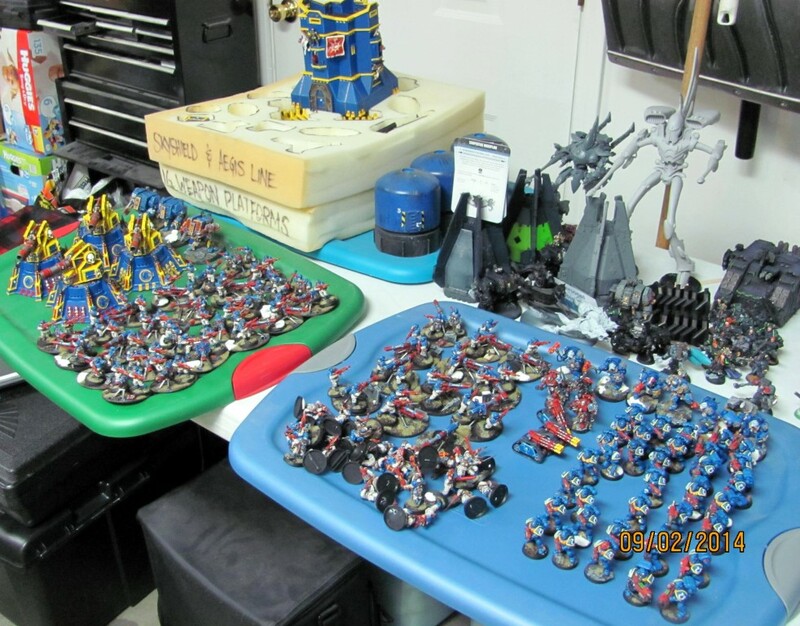 In any Apoc game, Kurt has to bring more Forgeworld models than anyone. 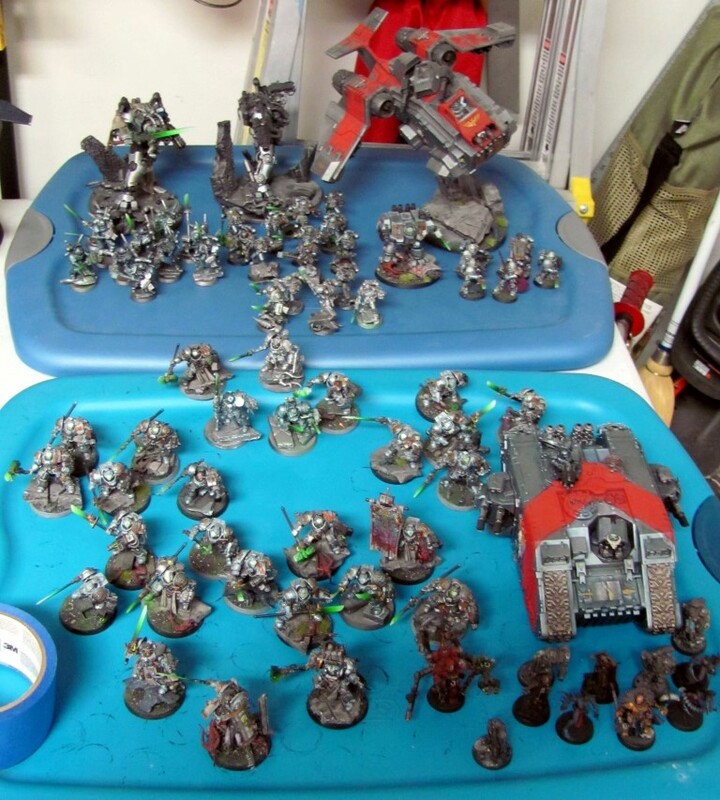 I think that guy owns every Forgeworld model that’s legal to play in a Space Wolf Force. 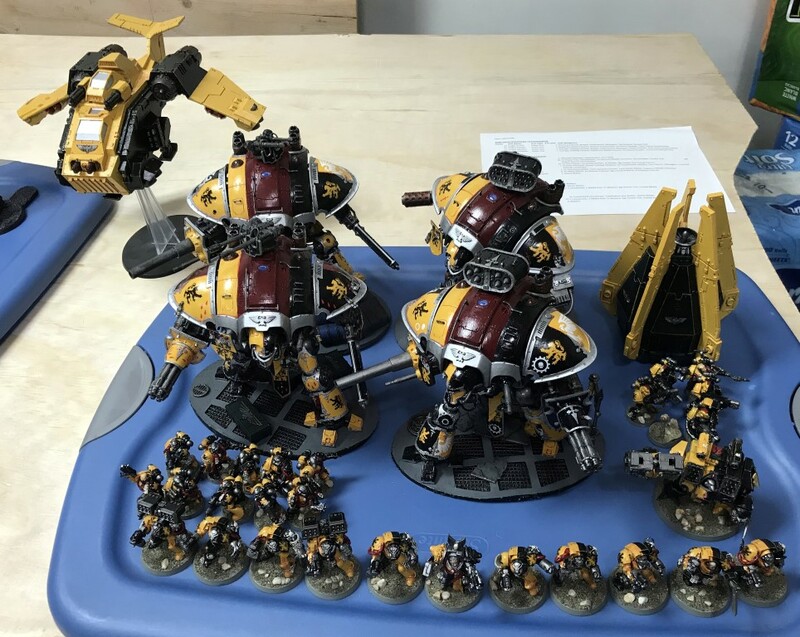 When he ran out of marine models, he started picking up IG models—so it shouldn’t’ have been a big surprise that he unveiled his new purchase: three fully painted titans. The looked great (except when they were falling apart on top of my army), and provided some real scale to the table.